Members and guests of Société Mondiale gathered at the Sangamo Club on June 2, 2018, to enjoy the opportunity to taste 12 Sauvignon Blanc wines from around the world, specially chosen by Echanson Geoff Bland. The diverse offerings hailed from the USA, France, New Zealand, South Africa, Australia and South America. 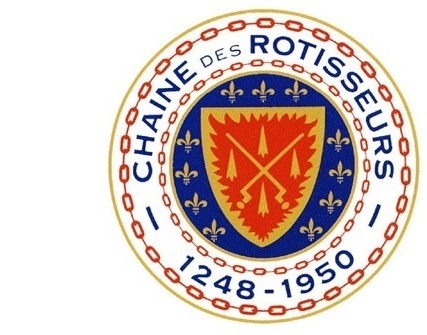 The focus of the Société is to give members an opportunity to become more educated about particular wine styles and regions, further develop the palate, and gain an appreciation of a broader wine experience. The Sauvignon Blanc taste is distinct from other white wines, such as Chardonnay, immediately recognizable for its green and herbaceous flavors. Sauvignon Blanc (French: sauvage ("wild") and blanc ("white")) originated in the South of France, but is now one of the most widely planted wine grapes in the world, and is second only to Chardonnay in popularity. As with all grapes, the terroir is crucial to the ultimate taste and success of a wine. The wines offered reflected the wide diversity of styles that Sauvignon Blanc can produce, each producing a familiar, yet unique taste of this varietal. And while Sauvignon Blanc is primarily thought of as a stainless steel aged wine, barrel fermented wines, such as the Groth Sauvignon Blanc (60% barrel, 40% stainless, on the sur lies) are on the market, providing yet another layer of complexity. Chef Joe did not disappoint with a veritable feast of finger foods to accompany the wines. Attendees enjoyed heavy hors d'oeuvres reflecting foods common to the country of origin of the wine. The evening exceeded the goal of providing both education and pleasure in the pursuit of expanding the enjoyment of fine wine. Mondiale members and their guest were treated to a delightful evening of finger food, refreshing summer wines, and live entertainment. The summer wine tasting was held July 5, 2017 at the Washington Park Botanical Garden. The weather and the grounds provided a perfect evening for after work/end of the day camraderie. The inspiration for this event came from an article from the New York Times, spotted by Jay Kitterman, featuring delicious but little known white wines from around the world. Echanson Geoff Bland seized on this idea to arrange a tasting of ten delicious but unfamiliar white wines. The wines paired perfectly with a tasty line-up of appetizers prepared by Chef Chip Kennedy of Five Flavors Catering. The excellent tunes of Smooth Times Band inspired several in attendance to hit the dance floor. This members-only tasting gave Mondiale members the opportunity to taste high end Pinot Noirs of limited availability. The event started with a side by side comparison of2013 Willams & Selyem and Kosta Brown from Russian River Valley, followed by the same comparison from their Sonoma Coast sites. The tasting concluded with a comparison tasting of multiple single vineyard sites from Williams and Selyem. This was a fascinating comparison to show how Pinot Noir demonstrates the terroir of the different vineyard sites with amazing difference and complexity of flavors. Members and guest sampled wines from France, New Zealand, Argentina, South Africa, Australia Chile, Austria and the USA. A selection of appetizers designed to pair with the wines was served. Chaîne and Mondiale members enjoyed the induction ceremony and Mondiale Dinner.